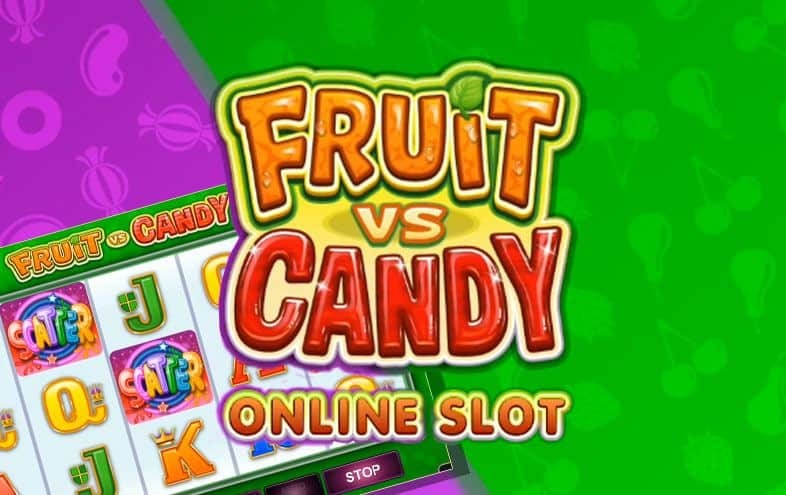 The Fortune Lounge Group of Microgaming Casinos bring you one of their newest games, the colourful and tasty Fruit vs Candy slot. This game brings a burst of colour and plenty of features to give you a boost and keep you entertained for hours on end. Fruit vs Candy has 5×3 reels, 243 Ways To Win, 2 base game bonuses, 2 Free Spins features and a whole lot of yumminess in winnings. This game can be played from either your Desktop or mobile device at any of the Fortune Lounge casinos (Royal Vegas, Euro Palace, Vegas Palms, 7Sultans, Platinum Play, Red Flush or Casino La Vida). Fruit vs Candy has 2 game modes, each with a different features and scrumptious symbols. In the base game, you can choose whether you want to play on the fruit or the candy side. You can however change sides anytime during the base game. This game is perfect whether you’re an experienced player or a newbie. The game has 2 unique Free Spins features, one for the fruit side and one for the candy side. To trigger your Free Spins, you must land either 3 or more scatter symbols in any of the base games and all bets played will be the same as the bet that triggered the Free Spins. Free Spins in the fruit feature are triggered with the Stash feature. The low symbols will be snatched off the reels for a cash prize. The fewer low symbols there are on the reels, the higher the Fruit win potential. The Free Spins will continue until all the low symbols have been stashed. The Candy Free Spins feature is triggered during the Sweet reel feature, where a full candy symbol stack landing on reel will sweeten that reel for the remainder of the feature. The sweetened reels will turn single wilds into Stacked wilds. The Free Spins will end only when all 5 reels are sweetened and when 50 Free Spins are reached. As for game features, Fruit vs Candy slot offers 2 different ones. Below, you will get some info on how to activate it and win more! The Goodie bag can appear randomly on non-winning spins and will award you a random cash prize just to add some excitement. The Sugar Rush bonus also shows up on non-winning spins in the Base Game. What happens during the feature is that each high symbol on the screen will award a random cash prize. If one scatter lands anywhere on the reels during this feature, it will automatically award you with Free Spins. Wild symbols are included and they substitute any symbol except the scatter symbol. The Scatter symbol adds to Ways To Win, multiplies by the total bet staked and pays in any position. Log on to any of the Fortune Lounge casinos and play to win up to 970,000 coins! Fruit vs Candy is packed with flavour and this will be your favourite food fight by far!